The vessel is a mile long, 25-storeys-high and has enough room for 50,000 permanent residents. 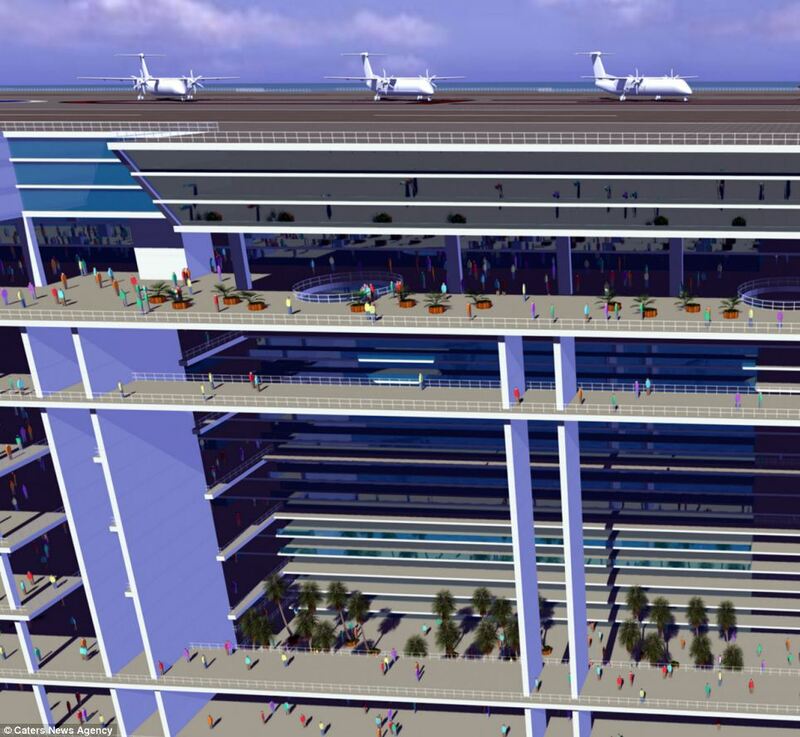 It features schools, hospitals, art galleries, shops, parks, an aquarium, casino and even an art gallery as well as an airport on the roof and a docking bay at the rear. Capacity: 50,000 permanent residents with room for an extra 30,000 daily visitors, 20,000 crew and 10,000 overnight guests. The designs also include a shopping centre covering 1.7 million square foot. Designed by Freedom Ship International (FSI), the vessel is set to cost $10 billion and would weigh 2.7 million tonnes - meaning it would be too big to ever enter a port. 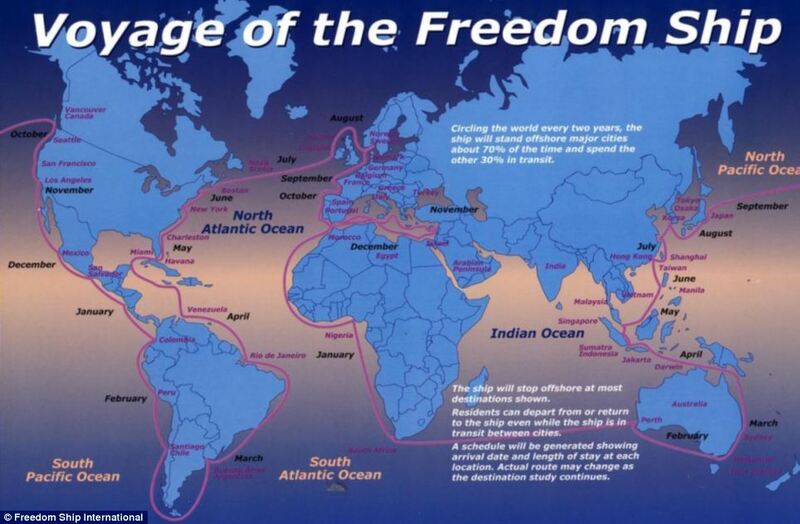 This means the ocean community would spend the whole time at sea, circling the globe twice a year. During this time, FSI claim the ship would spend 70 per cent off the shore of major cities and 30 per cent moving between countries. The route would take the ship from the east coast of the U.S across the Atlantic Ocean into Europe, passing Italy before looping back and sailing around Africa, across to Australia, heading north into Asia before spending the end of the year on the west coast of America and into South America. 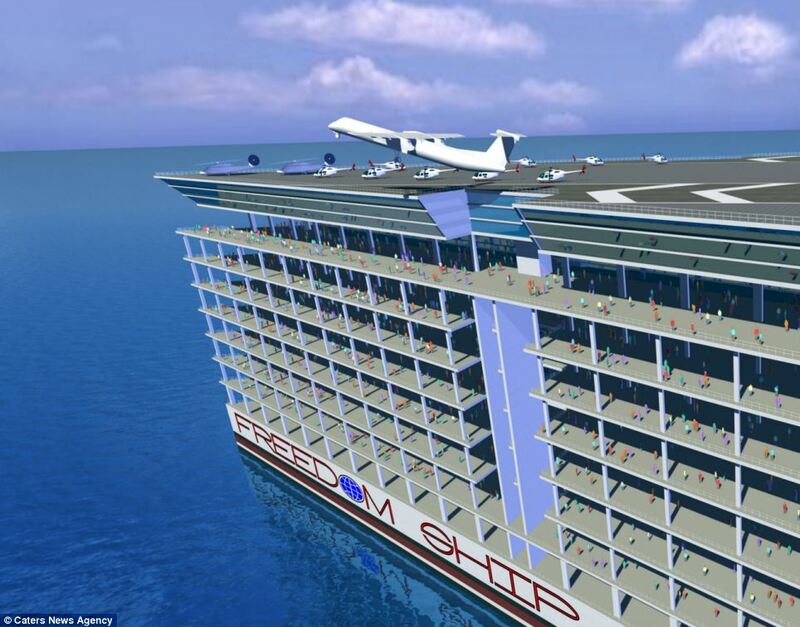 In addition to the permanent residents, the Freedom Ship would also have room for an extra 30,000 daily visitors, 20,000 crew and 10,000 overnight guests. 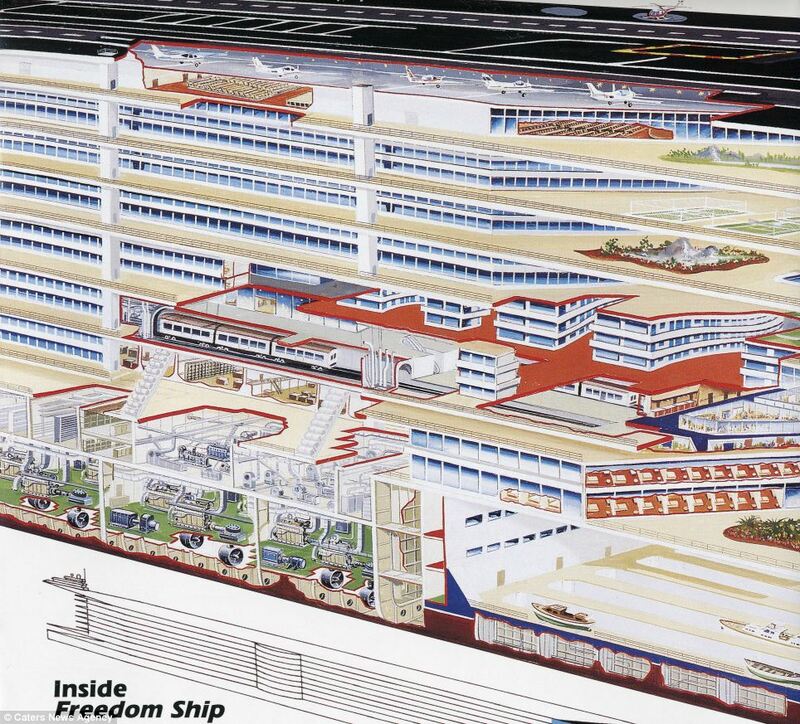 The airport, on the ship’s top deck, would serve private and small commercial aircraft carrying up to 40 passengers each. 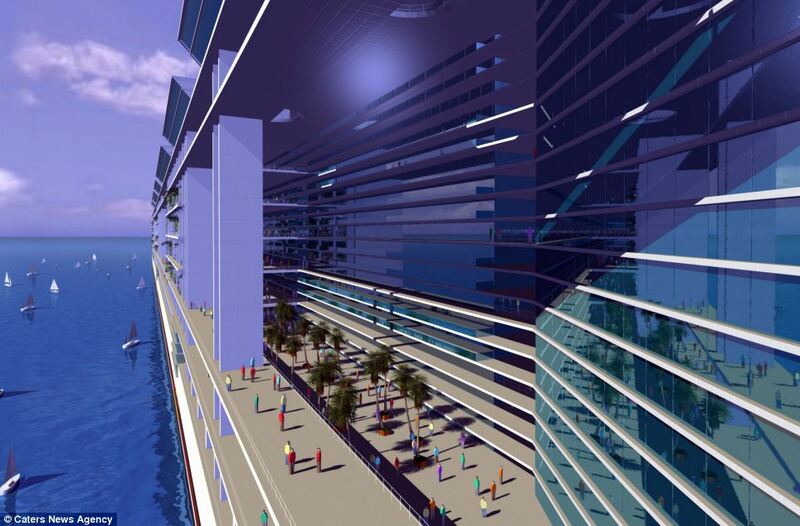 The whole ship will be 750ft wide, 350ft tall and 4,500 ft long - four times longer than the Queen Mary II cruise ship. 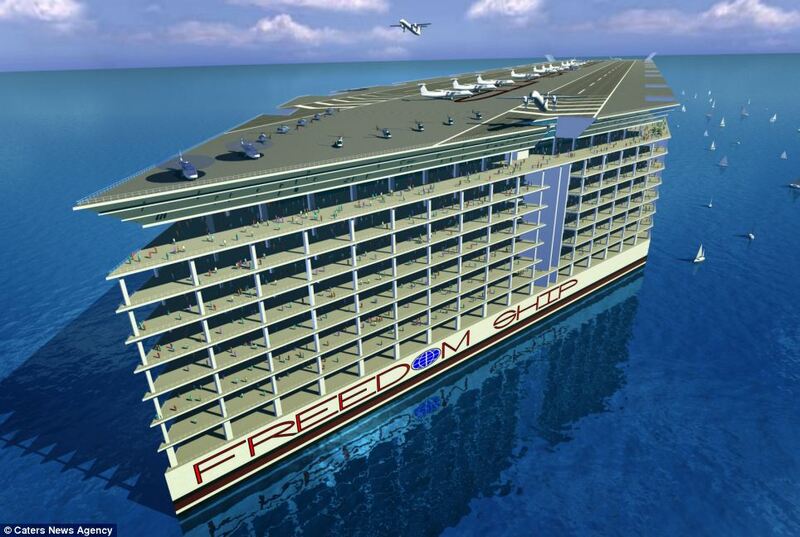 Roger M Gooch, director and vice-president of Freedom Ship International said: ‘The Freedom Ship will be the largest vessel ever built, and the first ever floating city. ‘This will be a very heavily capitalised project and the global economy in the last few years hasn't been too inviting for unproven progressive projects like ours. ‘Happily, though it has experienced a hiatus, the Freedom Ship now looks as if it is a live project again. 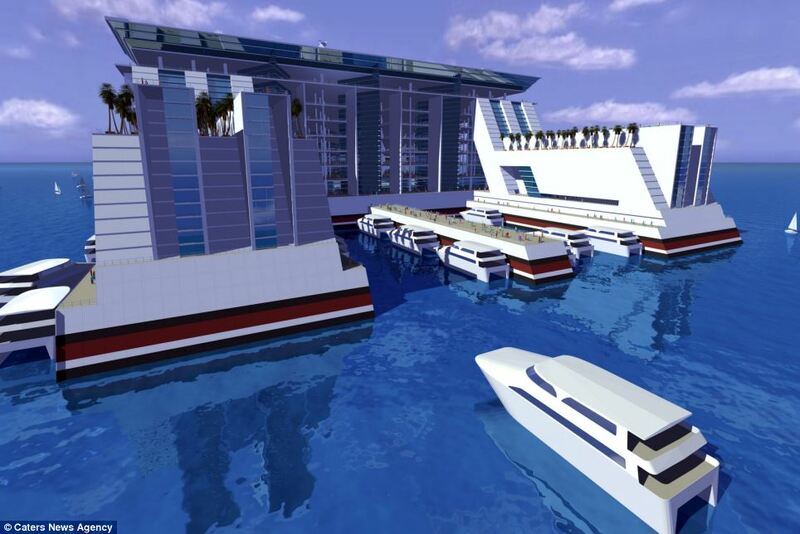 Power for the vessel would come from various sources including wave and solar power and on-board generators. 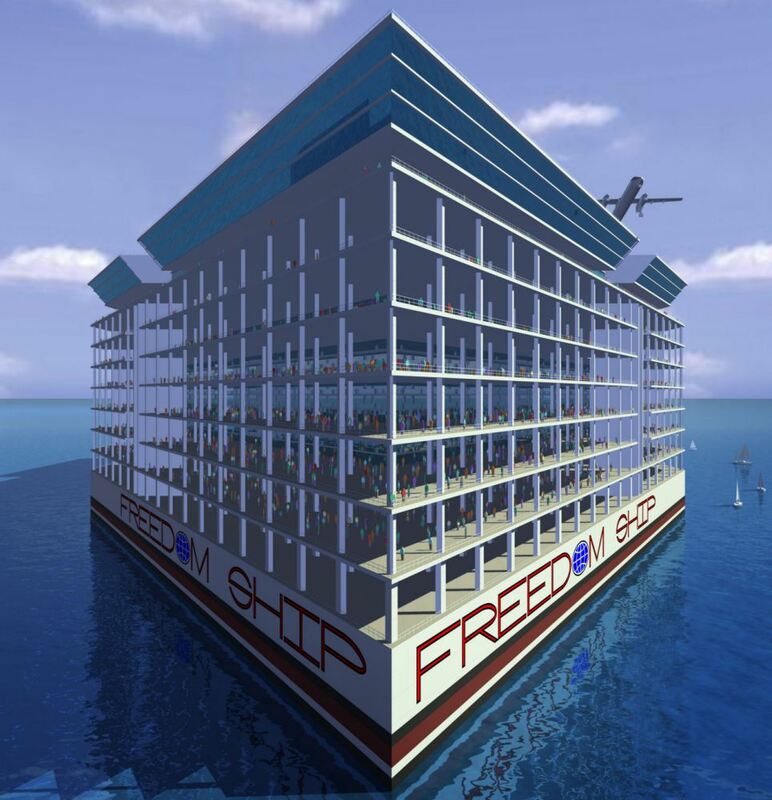 Visitors will be able to leave the ship, either by plane or boat, to visit cities and countries where the ship will also pick up supplies as and when needed.